Only about one in eight school districts in California have passed a parcel tax, and they predominantly have been wealthier and smaller districts. But if the threshold for passing a parcel tax were dropped from a two-thirds majority to 55 percent, an EdSource analysis suggests more districts with larger enrollments of low-income students would pass them. “Raising Revenues Locally,” an extensive look at three decades of parcel taxes, found that, had the 55 percent threshold been in effect from the start, 87 percent of parcel tax proposals overall would have passed, compared with just over half approved under the two-thirds requirement. Those districts in between 55 percent and two-thirds had a significantly higher percentage of English learners and low-income children than the districts that successfully enacted a parcel tax under current law. A Senate committee on Wednesday will hear SCA 3, a proposed constitutional amendment by Sen. Mark Leno, D-San Francisco, that would lower the threshold for passage to 55 percent. Democrats have been eyeing the opportunity for a lower threshold for a decade, but only now, with a two-thirds majority in the Legislature, do they stand a good chance of putting it before voters. Getting voter approval is far from certain, even though passage on the November 2014 ballot would take only a majority. Two polls this year, by the Public Policy Institute of California and by USC Dornsife/LA Times, found less than half of voters liked the idea. Parcel taxes must be uniform by law: Cottages and mansions must pay the same amount, and lower-income communities, dominated by apartment buildings that pay a single parcel tax, can raise less money than cities of single-family homes. A handful of districts have sought ways around this by charging various rates for different sizes and classes of properties, but last December, in Borikas vs. Alameda Unified, a state Appeals Court substantially restricted that ability. The district has appealed the ruling. Although parcel taxes are not a progressive form of taxation, they also are one of the few ways that local districts can boost revenues for local schools. Since parcel taxes were deemed legal in 1983, 222 districts – 23 percent – have put a parcel tax on the ballot, but only 124 – 13 percent – have passed one. That’s about one out of eight districts. Today, only 108, about one in 10, have one in effect. 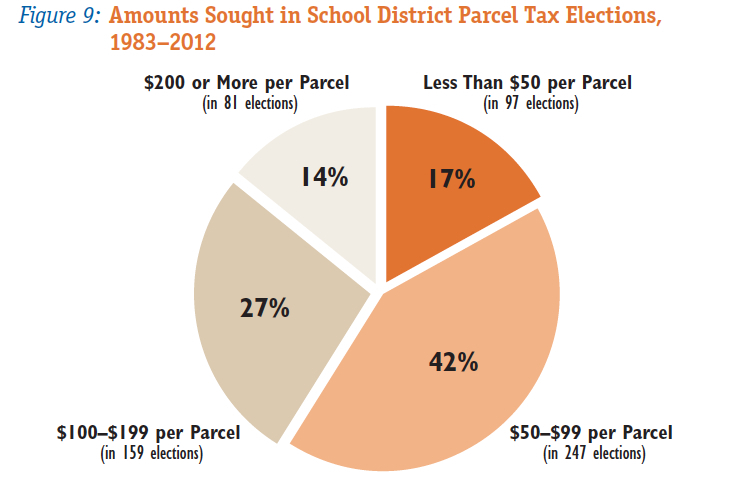 In more than half of districts passing a parcel tax, less than a quarter of students were from low-income families; in 16 percent, more than half of students were low-income (Ravenswood Elementary in East Palo Alto, Oakland Unified, Berkeley Unified and San Francisco Unified among them). 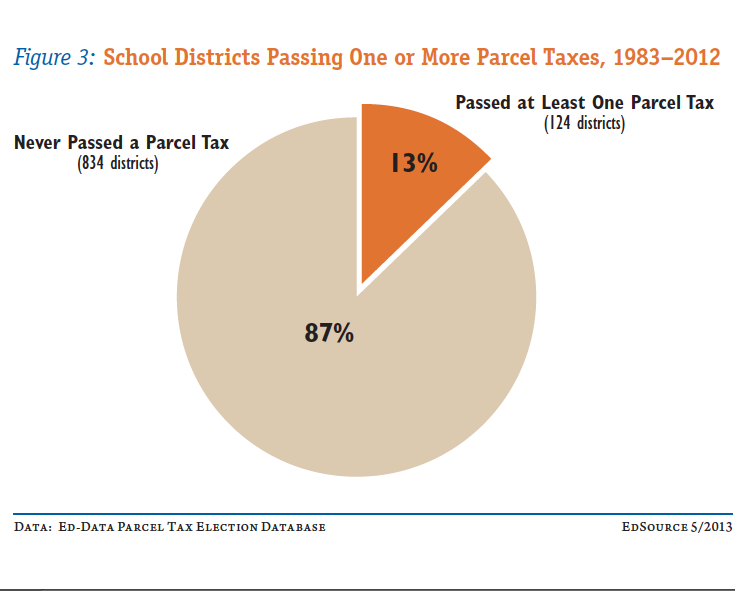 In the 124 districts that have passed a parcel tax, the student population was primarily white and Asian (two-thirds), with one-third Hispanic and African American.